Winter EDT Application Period Open! 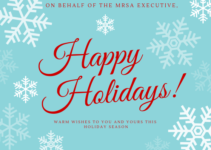 If you are taking any professional or personal development courses that begin between January 1 – April 30, you can apply for funding through the MRSA EDT Committee. Applications are submitted via the EDT database. The winter application period closes March 15. For more information, please review the EDT guidelines, policies and FAQ’s. November 20, 2018 was an historical day for public-sector employees as the long overdue joint pension governance legislation saw its First Reading at the Legislative Assembly of Alberta. A summary of the key elements can be found here. A link to Bill 27 can be found here. A link to register has been sent to all staff. Hope you can join us! Remember to bring your MRSA 40th Anniversary jars for a sweet refill!